Overlooking a golden beach, Hotel Mediterranean Palace is one of the most luxurious hotels in Tenerife. Located in Tenerife’s Playa de las Américas, it makes a gorgeous getaway for families and couples alike. 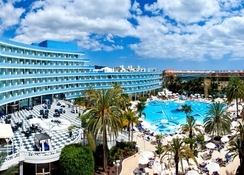 The Mediterranean Hotel in Tenerife is a part of the Mare Nostrum Resort complex and guests staying here enjoy access to all the facilities within the entire complex. Expect the best at this resort with stylishly decorated rooms that give spectacular views of the hotel’s pool, the sparkling Atlantic Ocean and the dramatic Teide Mountains. With a selection of 12 restaurants, bars and clubs, guests will be spoilt for choice when it comes to enjoying a meal or a cocktail. 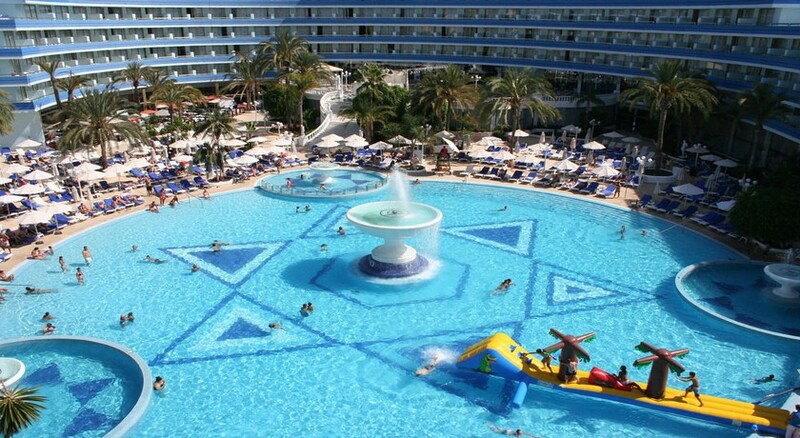 The Mediterranean Palace has an impressively large freeform pool, which is surrounded by a huge sun terrace, with sun loungers and waiter service. There are plenty of leisure and entertainment options to enjoy for adults and kids alike, including a spa and wellness centre, beauty salon, gym, separate clubs for kids and grown-ups and live shows. 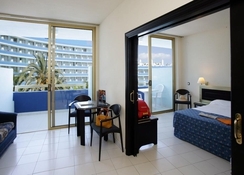 Hotel Mediterranean Palace is one of the few hotels in Tenerife south that enjoys a beachfront location between the Golden Mile and the Playa El Camisón beach. 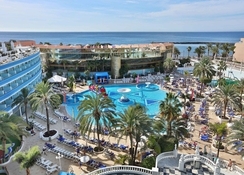 The hotel is surrounded by numerous beaches, the nearest is Playa del Camisón – about 50 metres from the complex. There is a harbour about 1.2 km away and the Siam Park water park is around 5 km from the complex. Guests can find various activities on the beach, or hike to Montana de Guaza and Montana Fria. Tenerife South Airport is about 18 km from the hotel. There are 535 rooms and suites in the Mediterranean Hotel Tenerife that are decorated in the white and blue hues of the Mediterranean Sea. Categorised into double rooms, family rooms and suites, the accommodation is modern and spacious, fitted with en-suite bathrooms with bathtub and marble finishing. There’s a furnished balcony offering spectacular views of the Teide Mountains, Atlantic Ocean or the huge swimming pool surrounded by palm trees and fountains. Amenities include air conditioning, telephone, satellite TV with safety deposit box, hairdryer and minibar. The suites have two different layouts: two rooms separated by a sliding door or a large room divided into spaces for living room and bedroom. Guests staying in suites also have the access to a private pool on the terrace. The wide selection of restaurants at Hotel Mediterranean Palace Tenerife serves everything from regional to international specialities. With both indoor and alfresco seating, the Mediterranean restaurant serves breakfast, lunch and dinner in buffet style, along with theme dinners and show cooking. The Windsor Restaurant is a luxurious option that serves a la carte breakfast, lunch and dinner. The gourmet dishes of Windsor can also be enjoyed sitting in the pretty gardens. The alfresco La Palapa Beach Club, located on the Playa El Camisón beach, offers meals and cocktails. 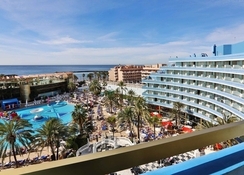 In addition, the Hard Rock Café in the hotel is Europe’s largest and occupies two floors where you can have a meal or sip a cocktail on the terrace looking out to the Golden Mile. For bar life, there is a sports bar with plenty of games, TV screens and drinks. Bar Vitamina is located next to the pool and serves juices, salads, snacks and ice creams. For a drink on the terrace while watching the glorious sunset, the La Terrasse bar is a great option. Salón Imperial offers live music, mini-disco, acrobatic performances and bar service, while the classic Bar Hall is where you can listen to the piano while enjoying a cocktail. Water lovers are in for a treat at Hotel Mediterranean Palace as it features a 1,300 sq. Metre large swimming pool surrounded by palm trees, fountains and a huge sun terrace with beach chairs and waiter service. There’s a mini pool for kids (0-4 years) supervised by lifeguards at all times. The Mare Kids Club has over 800 sq. metres of indoor space for fun, which includes a multi-game area, puppet theatre, rest area for parents, crafts area and music area. The Mare Leisure Club organises fun activities for the grown-ups, including dancing classes, cocktail making, photography workshops and Pilates. For relaxation, head to the spa and wellness centre, which offers a range of massages, treatments and therapies. The Mediterranean Palace in Tenerife has a great range of gym equipment’s in its fitness area. Lovely hotel, staff are very friendly and helpful. Hotel facilities were great, location is fantastic bars restaurants, shops and beach just outside hotel. There is also a shop Inside the hotel. Entertainment is good. Great holiday. great location, beautiful area of town. Lobby area is still fabulous & the large pool gives plenty of space even during busy periods. All spa facilities are extra, including steam/sauna which should be free in a 5*. Hotel was once a grand 5*, but the building is now old, the rooms too small & beds are hard. Staff are nice & helpful, arranged to move room to a quieter location & fitted a mattress topper. Food was quite average, but there are hundreds of restaurant to choose from in the area, you will need to head off the main strip for much better value & quality food. We found a Lebanese restaurant in Los Cristianos which was fantastic & the waitress saved us money with her suggestions, otherwise we would've seriously over ordered. Unfortunately i can't remember the name. Hotel needs a refurb, if they upgrade some facilities & food, reconfigure rooms & change beds they could easily charge more & it would still be worth it. They have a lot of underused space. Close to the beach, the town center and entertainment area. Friendly staff, free childcare. The hotel is getting old, refurbishment would be a plus.